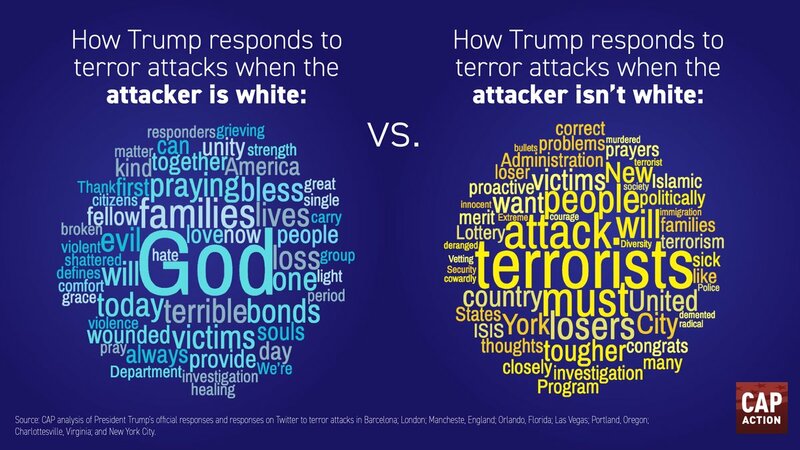 Many have commented on how our Pr*sident talks about terrorist attacks, specifically the differences between his responses to a white shooter and a shooter of color. As qualitative researchers know, a graphic can make the point very strongly. This is from a Patheos post that I recommend. The last ten days or so have been really interesting in the presidential campaign. I think the news over that time may have changed my mind about the length of presidential campaigns. Like many of you I looked with envy at the short UK campaigns. And I’ve complained as our campaigns stretch into another year. In so many ways, of course, this campaign is unlike any prior campaign. The difference is Donald Trump. Hillary Clinton is the first woman candidate of a major party, but is in most respects a conventional candidate. Trump is anything but conventional. It has taken time, perhaps months or years, for investigative reporters to figure what to look for and where to look in exposing Trump’s past. He has no political history. Where reporters have been investigating the Clintons for decades, they are just getting started with Trump. In only the last couple of weeks, the Washington Post’s David Fahrenthold has written about illegal behavior of Trump’s foundation, including that the foundation appears to lack even the basic documentation from the state of New York to accept tax deductible contributions. He has also exposed self-dealing, illegal behavior for a foundation. Fahrenthold has been on the story since January, but it takes time to build a case and develop the story. Similarly Newsweek’s Kurt Eichenwald has documented Trump’s violation of the embargo of Cuba. These stories don’t get investigated and reported in a couple of weeks. Vox has a good summary of Trump’s corrupt past. Maybe a longer campaign is a good thing, since it may take a while to figure out what a candidate has done, when that candidate has no political history and reporters have to start from scratch in building that history. They could not have done that work in three months or so. But last night MSNBC played most of Trump’s speech live. This was the speech in which he announced his plan to bar Muslims from entering the country. Yes, that’s newsworthy. But the whole speech was not newsworthy. MSNBC was just giving him free air time. It would have been better to use the time to play his statement on Muslims, then discuss it and talk about its basic inhumanity, impracticality, and conflict with American values. I’m not afraid of dangerous ideas. But I want serious journalists to take their time to analyze issues, bring in knowledgeable people, and help us think through the consequences of crazy ideas. Confused by the so-called Islamic State? Nathan Spannaus has a post on the Juan Cole blog that may help you understand the dynamics of the rise of ISIS.